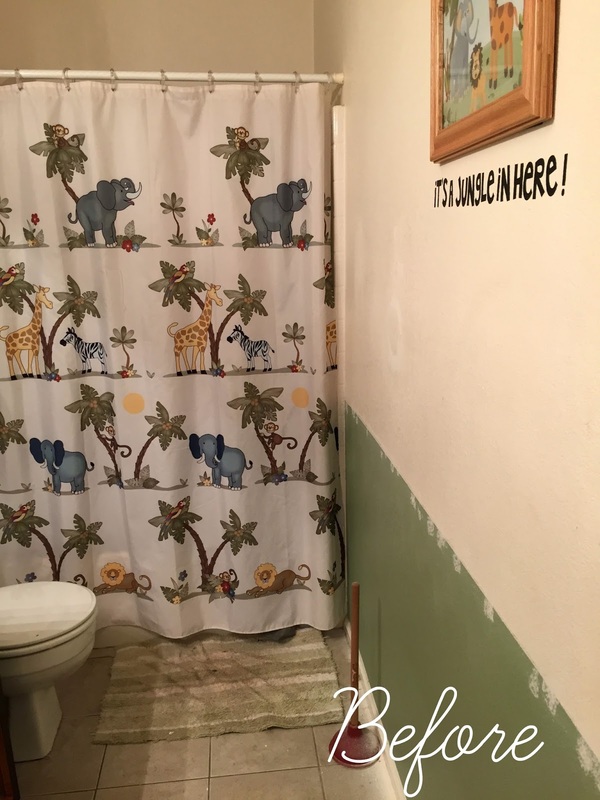 When my kids were younger, my husband and I decorated their bathroom in a gender neutral jungle theme. 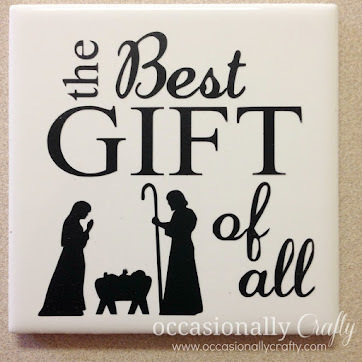 It was perfect for two boys and a girl, and for a bathroom that they share with any guests we might have visiting. 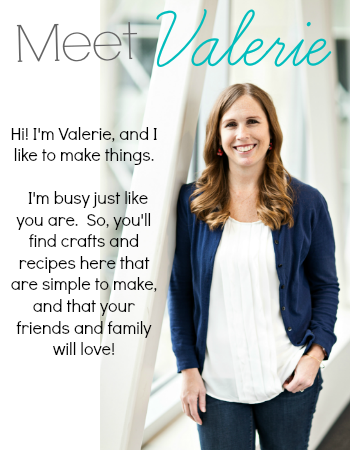 Now my kids are older, and all of us are ready for something a little more grown-up. And here is how it looks today! Sure, there are a few more finishing touches I need to add. I'm looking for the perfect wall art to hang, and I'd like to get a shelf to hang over the toilet, but this is basically our new and improved bathroom! I will have a more in-depth tutorial for this next week, but the first thing I did was stain our golden oak cabinets using Java Gel Stain from General Finishes. 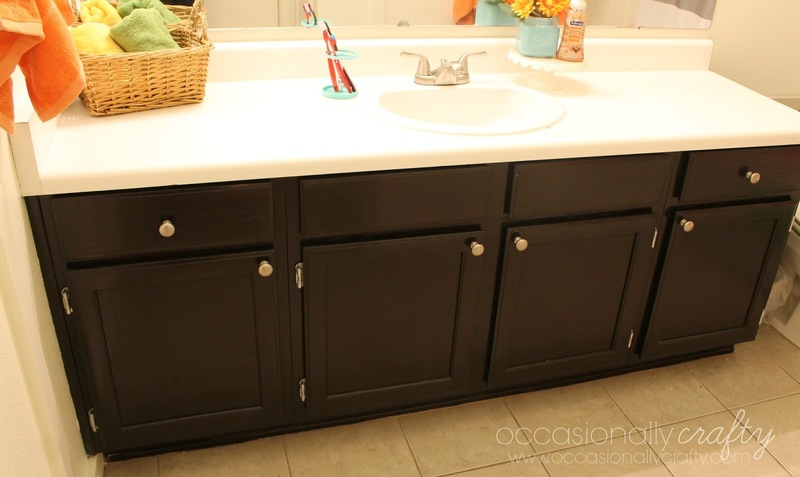 Since I now have gorgeous cabinets, I wanted to dress up the sink and countertop. I purchased the silver hardware for my cabinets from Walmart, and while I was there I picked up a few other things. 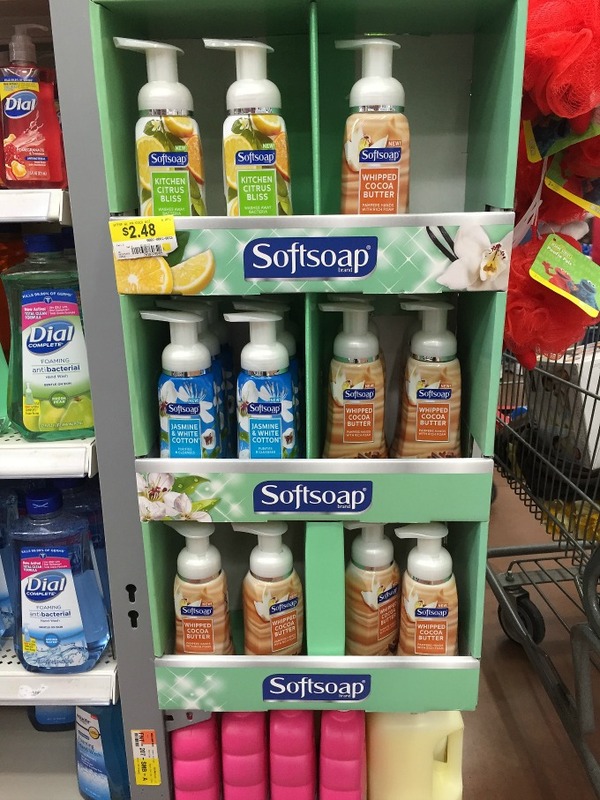 I found these gorgeous Foaming Hand Wash soaps from Softsoap in a special display at the end of the soap isle. They come in three varieties, though one is specifically for kitchen use (which I'll talk about in a minute). 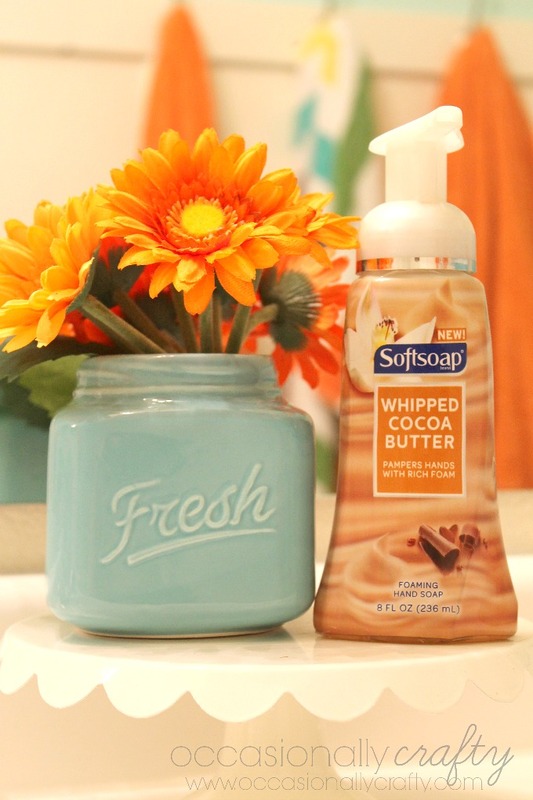 I chose to display the Whipped Cocoa Butter one in my bathroom because it matches my new color scheme. I'm already a Softsoap user anyway, but these foaming soaps are really a premium quality for a great price! Don't you love the orange and aqua together? I've long been a fan of these colors! I took those colors from the shower curtain I purchased. 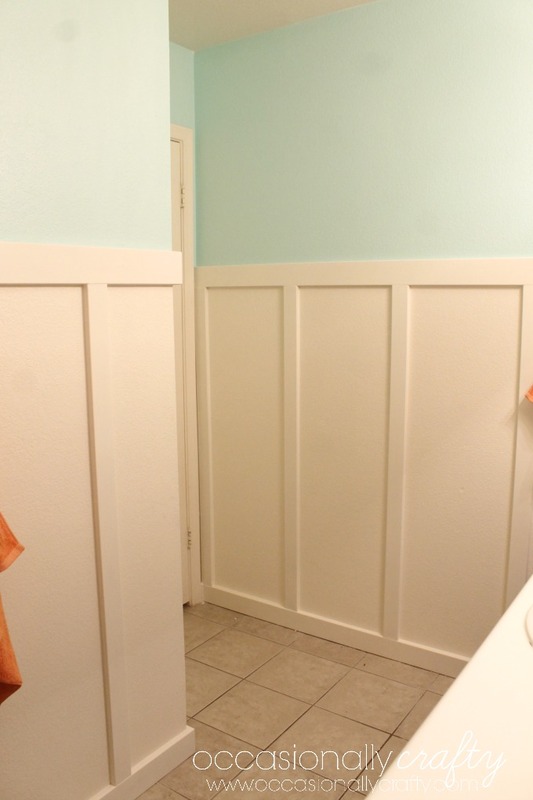 I painted the top part of the walls a light aqua shade, and then my husband and I installed faux board-and-batten using MDF planks. I love how it looks! 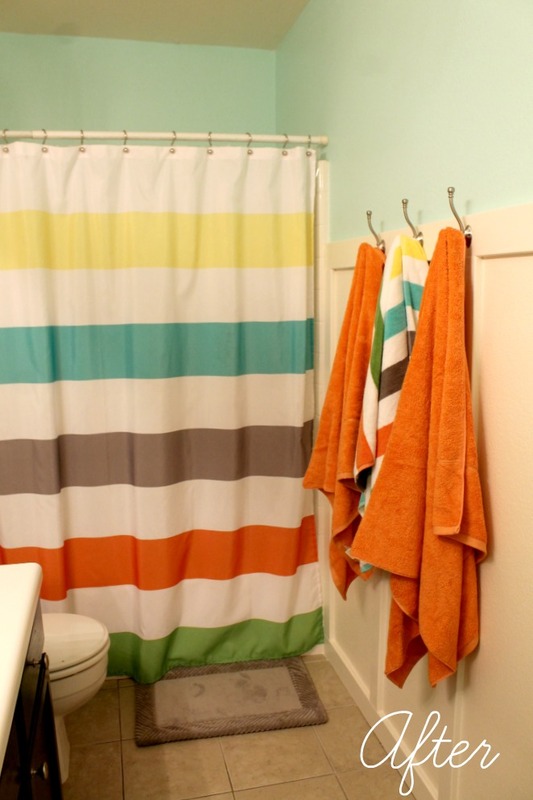 I bought towels to match the stripes in the shower curtain as well. Our bathroom now is just bright and vibrant where before it was much darker and even a little dull. 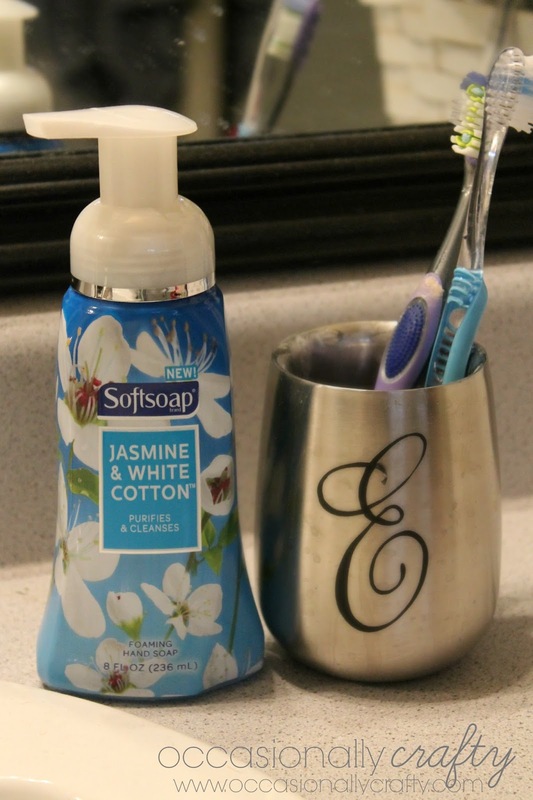 And, the Jasmine and White Cotton matches our gray and blue master bath perfectly! 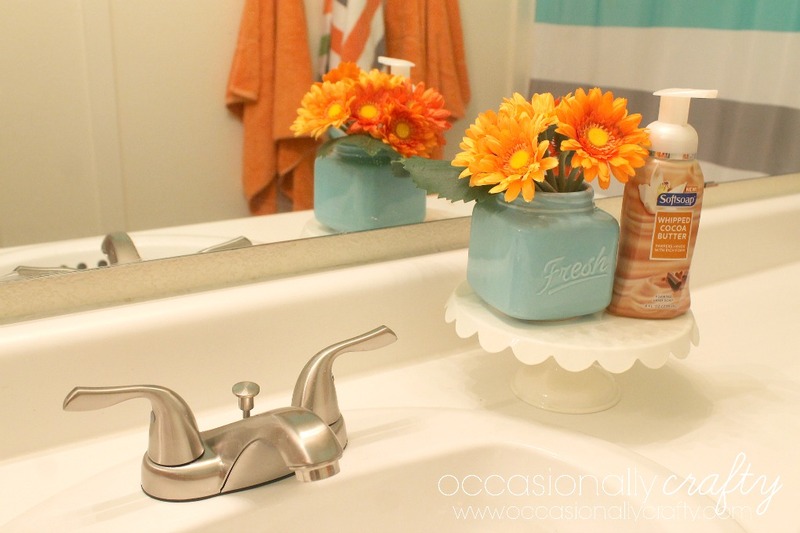 How do you dress up your sink? Which scent are you dying to try first? 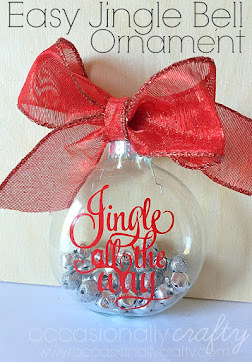 I'll see you back here tomorrow with a special Craft Lightning post: Recycled Crafts! P.S. I will be linking up to some of these parties. Come party with me! 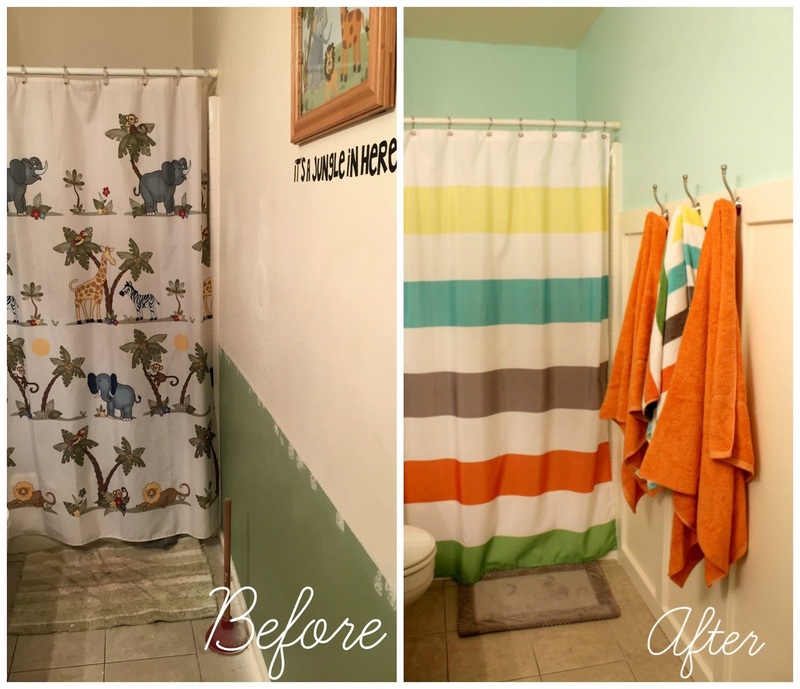 Oh I love the way you redid your bathroom! I just recently moved into my dads house and he hasn't changed the upstairs bathroom since my little sister was little so we have blue tile!! And I hate it! I need to find a cheap way to fix the floors in there! Great job! I love the new shower curtains (so cheery for Spring). 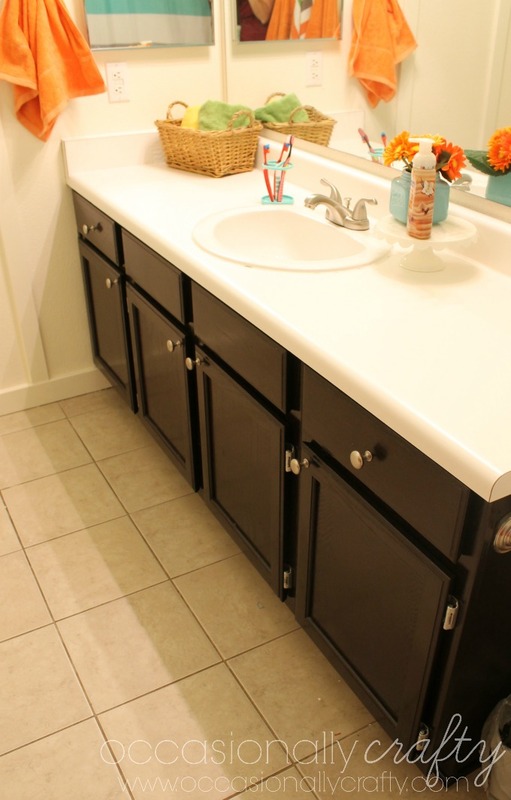 It's amazing how much better your vanity looks now that the color has been changed. Nice work! Thanks Theresa- I love it so much more now! This looks AMAZING and is so incredible. It looks great! I love the colors and the cabinets. 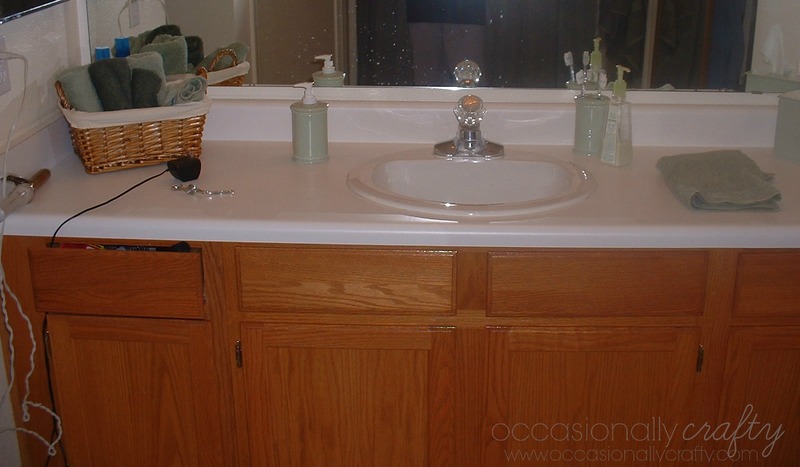 I especially love the fixture on the vanity. 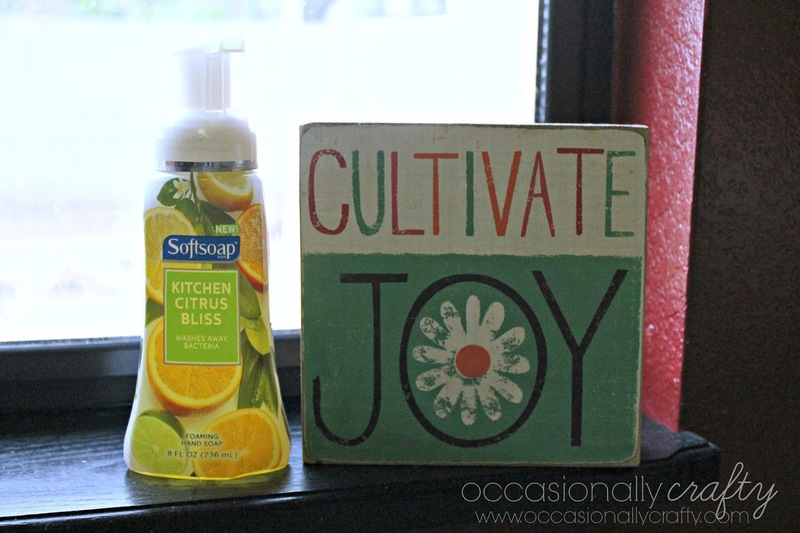 Yes, my kids love foam soap as well as me. You did a wonderful job on their bathroom. Thanks Jccee! I appreciate it! Oh the board and batten... I LOVE. What a lovely bathroom redo. Thanks Sharon! 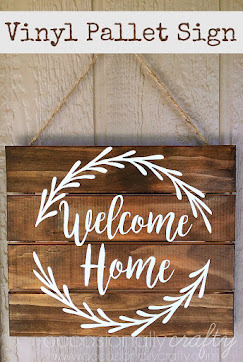 I love board and batten- it's such a timeless look. I love the stripes and bright colors! Looks great! Wow! You did a lovely job - it's so nice and fresh! Thanks Sagan! It does feel so much lighter in there! Very pretty makeover. Beautiful colors! Thanks Ilona- I love the colors too! I love the shower curtain. I wonder if hubby would go for it. The shower curtain is from Target- "Rugby Stripe" if you decide to go for it. Thanks for stopping by! Wow! It looks like a summer theme! I love the colors! It is kind of summery! Thanks- I love the colors too! Oh my gosh! I love so much about this! We are re-doing our bathroom too, and it's funny because we forgot to take a "before" picture. My husband actually rehung some stuff to take a "before" picture halfway through. I LOVE your wall treatment and the cabinets. Great job! Thanks Kristen- good luck on your redo! I am the worst at taking before pics, I don't know why. I appreciate your kind words! I think this looks so fantastic. I love the pops of orange. Great job!